The Salton Sea (Sea) is an ecosystem facing large systemic changes in the near future. Managers and stakeholders are seeking solutions to the decline of the Sea and have turned to the scientific community for answers. In response, scientists gathered in Irvine, California, to review existing science and propose scientific studies and monitoring needs required for understanding how to retain the Sea as a functional ecosystem. 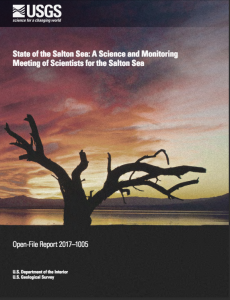 This document summarizes the proceedings of this gathering of approximately 50 scientists at a September 8–10, 2014, workshop on the State of the Salton Sea.